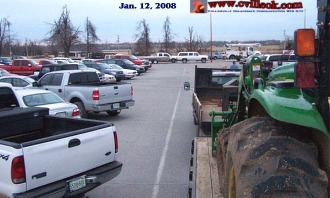 January 12, 2008 the Collinsville Highs school parking lot was a sea of big trucks, little trucks, tractors, and trailers. 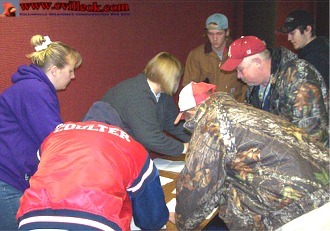 There were 200+ Collinsville Citizens and friends of Collinsville in the commons area. 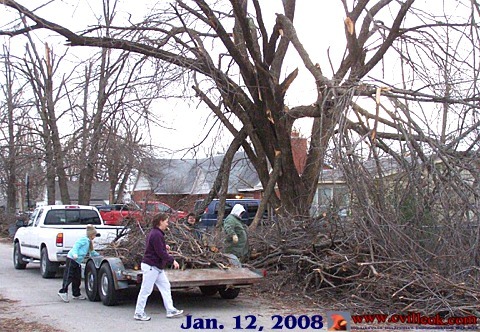 All were ready to answer the charge to help their neighbors clean up the brush and branches left by the ice storm of December 2007. 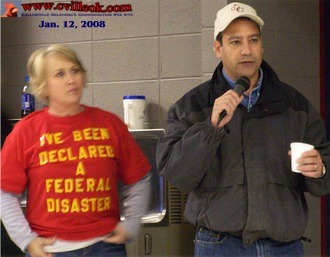 I was so proud of all the people who turned out to help their city and their neighbors. 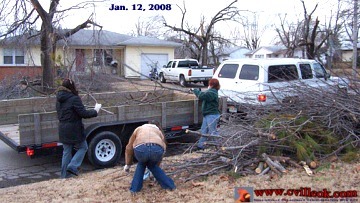 You knew that each one of them had their own yards and farms to clear but they volunteered their hours, their equipment, and their fuel on this day to help their neighbors. Thank you County Commissioner John Smaligo for working with FEMA on our behalf and State Representative Earl Sears for joining in with the brush brigade to help one of the cities he represents. Thank you Mayor Sallee for leading the charge to help our city clear the brush. 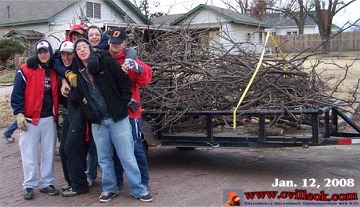 Thank you also to the residents who came out and helped the volunteers load the brush in front of their homes. This project was a joint effort of the Collinsville Chamber of Commerce, The City of Collinsville, Collinsville Downtown, Inc. and the Collinsville Ministerial Alliance. We put out the idea and you answered the call. Our city is stronger because of this effort. 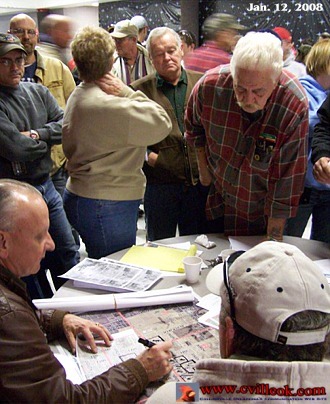 We pulled together over 200 citizens to answer a need. 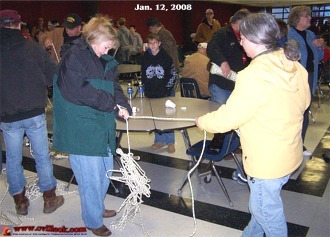 We laughed together, broke bread together, and got lots of brush injuries all for the common good of our town. We live in Collinsville because we love our town, our neighbors, and our quiet on the edge of Green Country. But not only do we live here, we take care of each other. 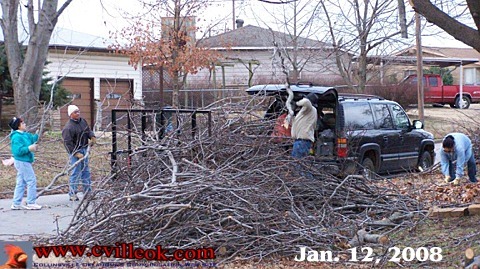 Thank you Collinsville for answering the Charge of the Brush Brigade! 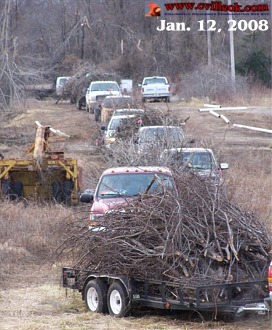 Of the 250+ brush pickup volunteers that signed up Saturday Adam Sallee likely had the most "seniority" (at nearly 91 years of age). 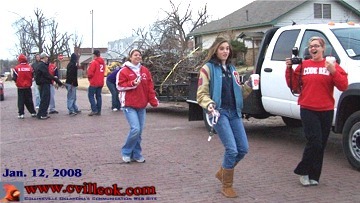 Collinsville's youth were also well represented in this community effort. 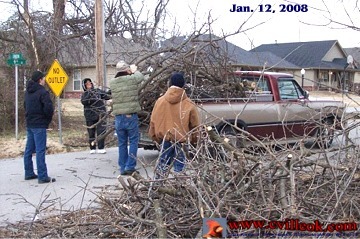 Many city employees gave up yet another weekend day as the recovery from the ice storm of Dec 9-10, 2007, continues. There are so many others to thank including other communities and businesses that donated equipment and labor for the effort Saturday. 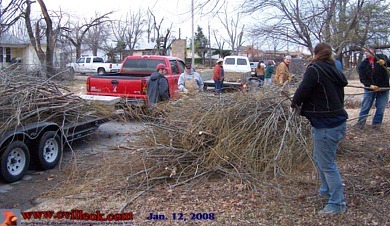 If your brush was not removed Saturday (or you have not had a chance to drag your limbs to the curb) a repeat of the Jan. 12th effort is being considered. 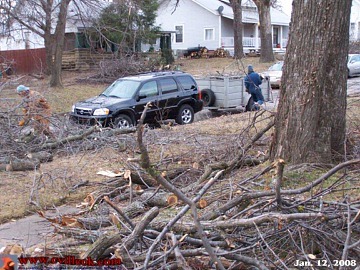 If you have suggestions to improve a repeat effort please email me or contact the Chamber or City. I tried to get photos of as many pickup crews as I could find by random driving around Saturday but know I did not catch everyone. 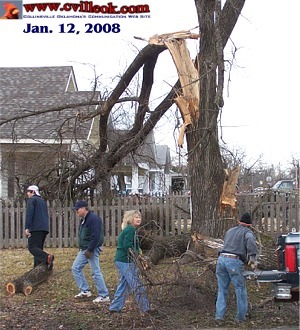 There are also many photos taken that did make these pages to support the potential FEMA 75% reimbursement of the brush removal effort. Trucks and trailers lined up to unload multiple times.